Speedup your applications using accelerators in the cloud, instantly. 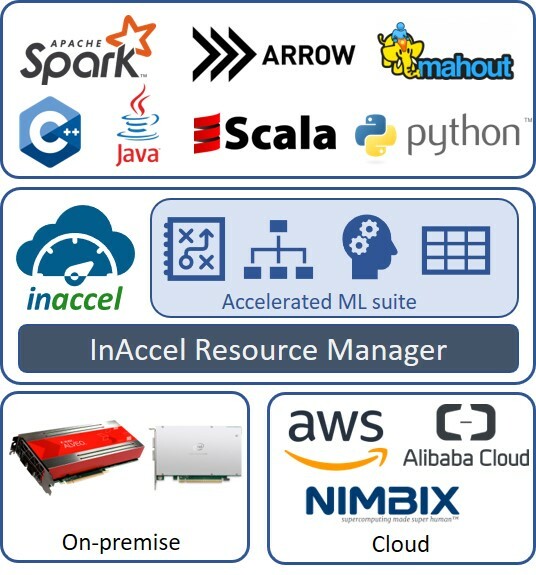 The hardware accelerators of InAccel are fully compatible to Apache Spark ML framework and allows faster execution of Spark-based applications based on machine learning (ML, MLlib) libraries. InAcce's framework utilize FPGAs to accelerated the ML kernel without changing your Spark application. We develop custom hardware application for FPGAs tailored-made to your applications. The accelerators can be deployed in the Amazon AWS F1 and the Intel FPGA Platforms. ​Use the hardware accelerators to speedup your applications in terms of throughput and latency (execution time). InAccel is an official member of the Xilinx Alliance Program, a worldwide ecosystem of qualified companies that offer IP cores, EDA tools and modules. InAccel is a official Standard Technology partner of Amazon AWS specialized on f1 FPGA instances. ​InAccel is a official seller of Amazon AWS Marketplace and is specialized on the development of IP cores for Amazon f1 accelerators. All accelerators are compatible with the Amazon AWS F1 instances. AWS compatibility allows easy and fast deployment of the accelerators and seamless integration with your current AWS applications. InAccel provides all the required APIs for the seamless integration of the accelerators without any modifications on your original code. Accelerators from InAccel provide up to 15x speedup compared to contemporary processors in typical servers.